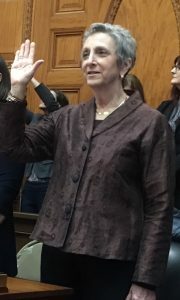 Rep. Balser being sworn in at the Massachusetts State House in January of 2019. On Election Day 2018, the people of the 12th Middlesex District elected me, for the eleventh time, to serve as their State Representative. It is a great honor to represent the people of Newton on Beacon Hill. With their support and partnership, I will continue to be a progressive voice in the Massachusetts State Legislature. I will continue to do all that I can to make sure that Massachusetts provides its people with world-class public services and that there is a strong safety net for the most vulnerable among us. I will continue to focus on behavioral health care and equal rights for all people, and to address the increasing threats to our environment. I look forward to a continued partnership.